Poisson - Dictionnaire Visuel - Copyright © 2005-2016 - Tous droits réservés. 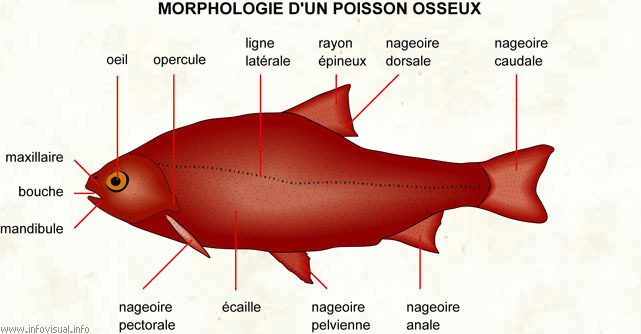 [img]https://infovisual.info//storage/app/media/02/img_fr/032 Morphologie poisson osseux.jpg[/img] [url=https://infovisual.info/fr][/url] - [url=http://www.infovisual.info/]Dictionnaire Visuel[/url] - Copyright © 2005-2016 - Tous droits réservés. Aquatic vertebrates that are cold-blooded, covered with scales, and equipped with two sets of paired fins and several unpaired fins. Aquatic vertebrates are abundant in the sea and in fresh water, with species being known from mountain streams as well as in the deepest depths of the ocean. They are of tremendous importance as food for people around the world, either collected from the wild or farmed in much the same way as cattle or chickens. Fish are also exploited for recreation, through angling and fishkeeping, and fish are commonly exhibited in public aquaria.